The Indian Space Research Organisation (Isro) has plans to launch its GSLV III Geosynchronous Satellite Launch Vehicle Mark III by 2009-10. The new machine, when ready, is expected to help India increase its share of the $2-billion global satellite launch market. Isro chairman Madhavan Nair said that GSLV III would double payload capacity to about 4,000-5,000 kg. The operational target is set for 2009-10. 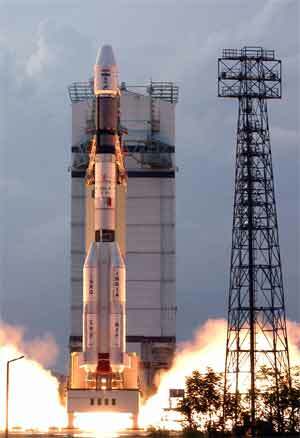 Isro has been paying about $70 million (Rs 280 crore) for carrying a payload of 3,000 kg to foreign players. Moreover, the space agency is looking to grab a slice of the $2-billion global satellite launch market with GSLV III. It has so far earned revenues of about $30 million from commercial launches of satellites. “The new launch vehicle can give better reliability and lesser operational costs because it will employ fewer propulsive stages,” Nair said, adding that the various substations are currently undergoing ground tests. GSLV III is an entirely new three-stage launch vehicle and is not derived from Polar Satellite Launch Vehicle or GSLV Mark I and II series. It is intended to launch heavy satellites into geostationary orbit, and will allow India to become less dependent on foreign rockets for heavy lifting. According to officials, GSLV III is slated to take into orbit two-three Indian communication satellites apart from commercial ones. They added that the vehicle would be completely dedicated to Isro’s missions in the first couple of years. The investment going into building GSLV-III is about Rs 2,500 crore compared to Rs 1,500 spent on GSLV I and Rs 336 crore for developing the cryogenic engine for GSLV II. Isro currently uses GSLV I, which can carry payloads of up to 2,250 kg, to launch the bigger satellites or outsources to foreign rockets. GSLV II, with completely indigenous cryogenic engine, will take off when it launches Chandrayaan into orbit later this year. This entry was posted on September 23, 2009 at 8:38 am and filed under SPACE. You can follow any responses to this entry through the RSS feed. You can leave a response, or trackback from your own site.